Thai desserts are so wonderful because they typically feature a slightly sweet, salty and rich component. This tapioca pudding delivers a dose of all of those, as well as boasts an incredibly fluffy and light texture, alongside a softly gelled layer of salted coconut cream. To make the coconut cream gel, I incorporated some agar powder which I first dissolved in hot water. Agar has the ability to transform any liquid to a gel once cooled, with the advantage of not affecting the the overall flavor of a dish. This is a perfect dessert to enjoy during the summer when served cold, but does require a dedicated 15-20 minutes of constant whisking over a stovetop. 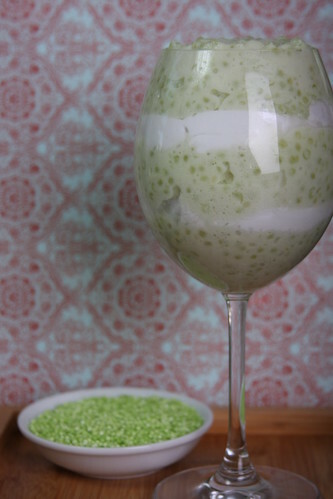 I used green tapioca for the photo because I love its beautiful green color, but any small pearl (not instant) variety will do. To make this, you’ll need to soak the tapioca beads in one cup of the almond milk as well as prepare the coconut cream the night before. To make the coconut cream, place the coconut milk and oil into a mixer and combine well over the highest setting, for about 4 minutes. To prepare the agar mixture, place it with the boiling water in a small pot over medium low heat, stirring frequently until the agar has completely dissolved. Add that to the mixture, along with the salt. Transfer to a plastic container to chill and gel overnight. To make the pudding, combine the soaked tapioca/almond milk mixture with the remaining pudding ingredients in a medium-sized pot over medium heat. Immediately begin whisking the mixture as it heats, for about 15 minutes (a little more or a less time may be necessary). You’ll know that it’s ready once the tapioca becomes translucent and the mixture becomes really thick and frothy. Its really important to whisk briskly and constantly during this time, as it will yield an extremely fluffy pudding as well as prevent any sticking or scorching of the pudding. When it’s done, remove it from the heat to cool. Transfer the pudding to a plastic container to chill for about 3 hours. To serve, spoon some of the pudding in a glass or bowl, layered with some of the salted coconut cream. It looks fantastic. I wish it was my breakfast right now! That's such a great idea to soak the tapioca in almond milk. I bet that really adds to the flavor. I love tapioca desserts and this one sounds delicious!